Like many metropolitan areas, Dallas’ is affected by an Urban Heat Island (UHI), which is caused by the large concrete areas that are warmer than the natural rural areas. Sometimes there is a 10-12 degree temperature difference between the inner urban and rural areas. By its nature, concrete, asphalt and buildings tend to absorb heat, and a lack of trees as well as other plant life prevents natural cooling from occurring. Additionally, the absence of vegetation that naturally removes pollutants from the air can lead to poor air quality. The committee is working with various city departments, including Dallas’ Environment Quality Department on reducing the UHI effect. In 1995, Texas Christian University professor, Dr. Ken Morgan, conducted the city’s first urban heat island study, which showed a large section of central and downtown Dallas having temperatures several degrees warmer than the surrounding suburbs and countryside. In 2009, the Environmental Protection Agency commissioned its own updated study on Dallas’ urban heat island areas providing further research on this issue. This heat effect can impact not only Dallas’ environment, but also its quality of life by having hotter than normal temperatures, higher energy bills, and poorer air quality. Reducing the urban heat island affect is challenging task; however, one effective tool shown to lower urban temperatures and improve air quality is the planting of trees. In fact, the 1995 study also revealed that Oak Cliff, and its tree covered neighborhoods, had one of the coolest temperatures compared to the rest of the city. Trees can have a positive effect on urban heat island areas. How Can Trees Reduce Dallas Temperatures? Large trees can provide shade to block the sun’s heat. Trees have a “moisture emitting” process, otherwise known as evapotranspiration that cools the urban air temperature by releasing moisture. Trees need carbon dioxide to survive, and through its “breathing” or photosynthesis process, significant amounts of carbon dioxide and other pollutants are removed, such as sulfur dioxide or nitrogen oxide. 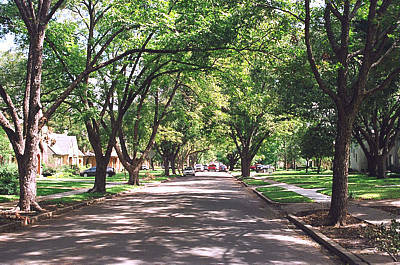 Taken together, trees can help cool urban temperatures and cleanse the air, which improves Dallas’ quality of life. What is UFAC doing to curb the Urban Heat Island? UFAC is helping to reduce the UHI effect, by encouraging various tree planting projects across Dallas – especially in the concrete laden parts of our city. The Adopt-A-Median project, increased planting in city parks and street medians, inclusive of other key tree planting projects and obtaining funding and support for such projects are some of the ways UFAC is helping to restore trees to Dallas urban areas and reducing the heat island effect.